Last week the whole river really settled into wonderful fishing conditions. The water height was perfect, the water temperature varied between 10⁰C and 15⁰C, and the run of fresh salmon steadily built up. It was perhaps a touch bright - and Murmansk airport yesterday was full of well-tanned fishermen’s faces with ‘panda eyes’ – but it was a joy to enjoy both the good weather and phenomenal fishing. I need only say that we landed just shy of 2,100 fresh, silver salmon to 39 rods in six days. With our fishing curtailed to six weeks by the late snow melt we are now half way through our season and with over 5,100 salmon landed so far and the run still coming in we seem set for a very good result. ﻿﻿All camps fished exceptionally well last week; the fish arrived into Pana in force on 1 June and the eight rods there had 332 for the week. The run got stronger as the week progressed and their last day accounted for 87 fish. I dropped the incoming party off there yesterday afternoon and the anticipation of the fishing was self-evident as they landed and walked (very fast!) to look at Camp Pool and rig up their kit. Over at Kitza, between several legendry Kitza ‘birthday parties’, they landed 407 with one extraordinary day of 92 salmon. Julian P reported the water level getting better by the day and possibly the best yet to come; we had to drag the team onto the departing helicopter. Middle Camp, of course, did well and at dinner on Friday night they were at 993 salmon landed. John C, who likes neat statistics, took upon himself the arduous job of rounding up the number and by 1 a.m. had landed seven to make it exactly 1,000 to 12 rods. So often fishing courses or casting instruction take place on rivers at a time of year, or on beats, where there is precious little chance of actually catching any salmon and putting the theory into practice. 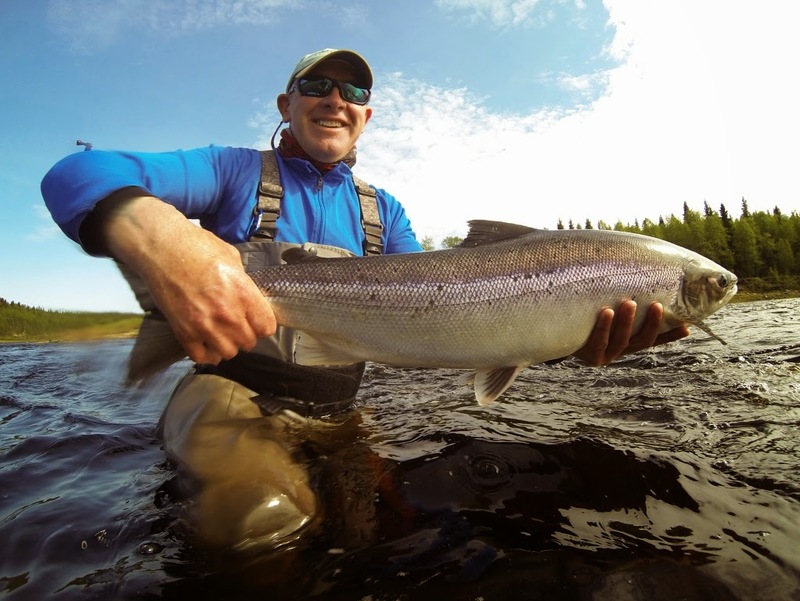 For the third year Eoin Fairgrieve joined Bill Drury at the Lower Camp on a week designed to provide the finest instruction on the finest salmon river. Besides learning a great deal and taking their casting skills to a new level the 11 rods landed 319 salmon - that really is putting it into practice! ﻿﻿The new teams arrived in really warm weather yesterday, 22⁰C here at Middle Camp, luckily today has started much cooler and overcast, good fishing conditions, and it looks as if we should maintain this weather pattern for a few days. With the Lower camp now closed we have 27 fishermen in three camps, Kitza, Pana and Middle; of those 27 only three have not fished here before, and with the river in perfect order we ought to be set for another excellent week.